1. Do not heat it on the fire directly. 2. Orange peel is good for cleaning up residual stains on the surface. 3. Humid dishcloth with toothpaste is effective for keeping it like new. 4. Do not clean it by steel wire brush to avoid scratching the chrome-plating cover. - Great Idea, Great Quality. 10.15 inch diameter with even distributed holes, heating fast. Thicken 304 Stainless Steel corrosion resistance materials, durable and sturdy for daily used. Easy cleaning by smooth surface and edge, which would not scratch hands or dishwasher. 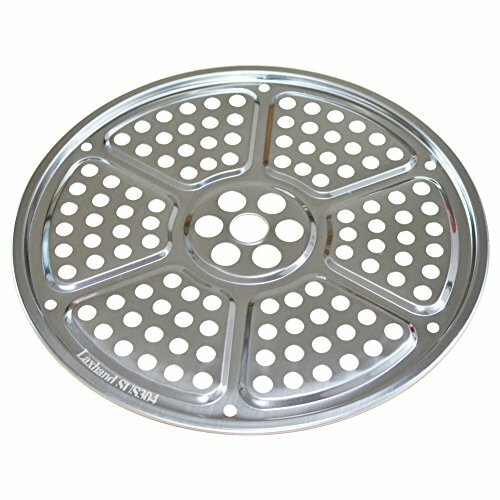 Compatible for kinds of pressure cookers, stockpot, pans or other cookwares with suitable diameter. Convenient for steaming dumpling, lobster, fish, crab or other seafoods, to keep them tasty and nutritious. If you have any questions about this product by Laxhand, contact us by completing and submitting the form below. If you are looking for a specif part number, please include it with your message.